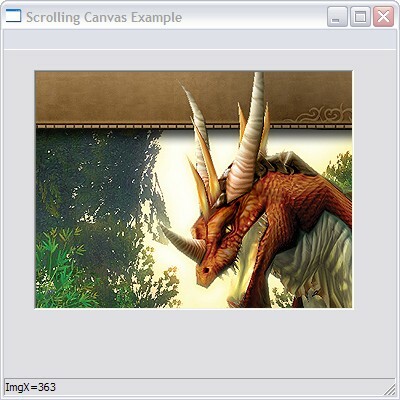 We need to understand 2 concepts if we want to understand how to implement scrolling images on canvases. Cut and Paste the program below and run it. We also need an image to load into this example. We should now be able to see an image scrolling across our panel. Now let us go through the code line by line. Then we need to create a window, a panel and a canvas. The Canvas needs to be grouped to the panel. The job of the panel is to clipped the image on the canvas to within its frame. Note that the panel is smaller than the canvas. When the timer event happens, we update our image X location. Also we need to check that if it runs over the edge we reset the location back to the start. The Paint Canvas Event will be generated when we call the above RedrawGadget function, The SetGraphics and Flip statements do the usual stuff, ie displays our canvas drawing to the screen. According to the manual, this function "Sets a gadget's position and size relative to it's group". The group in our example being the panel gadget. Now that we know how to scroll an image on a canvas using the SetGadgetShape function, the next concept we need to understand is how to use the slider gadget to give us the correct ImgX and ImgY variable to scroll our image. Our program is now slightly longer as we now need to add code to handle the scrollbars. Now we see our image within a scrolling panel. Clicking, dragging the scroll bar will produce the expected effect. The main changes from the example above are the creations of the Slider gadgets as can be seen below. We also need to set the slider range, this is important as the right slider range will give us ranges of slider values suitable for our use. I hope it is clear that the sliders are nothing more than a way for the user to enter the ImgX and ImgY values for our SetGadgetShape function to do the hard-work of scrolling the canvas. As you can see from this tutorial, you do not need all the esotoric hooks and OOP stuff to scroll images on canvases. They are good concepts to learn but a step at a time. The bad news is that this technique only work for images no bigger than the maximum size of a canvas. Currently MaxGUI limits canvases to the maximum size of the desktop. 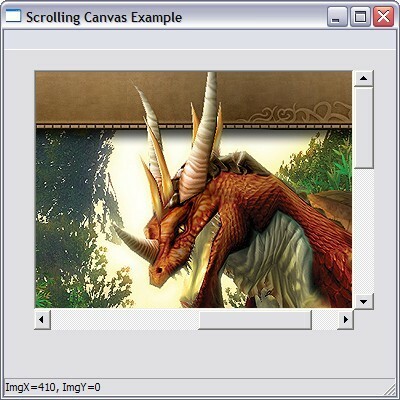 If you want to learn more about Canvas and Scrollers, you can take a look at my MaxGUI beginner tutorials, specifically Tutorial 12: Canvas, Events and 2D Graphics and Tutorial 13: Sliders and Scrollbars.